The Polished Teacher: It's The Best Day Ever! It's The Best Day Ever! I can't help but think of Spongebob singing for my post title today. Today was a great day! I didn't expect it to be a really good day either because it starts my month of no-days off so I was pleasantly surprised! If you have Spring Break this month, don't even bring it up! I started the day off by registering for classes! All signed up for student teaching! Where has the time gone! I can't believe I registered for senior year already! It's really happening! The day I have been waiting for is nearly here! Then, I found out that Pixar will be a making Finding Dory in 2015! Ahhhhh! Finding Nemo is my favorite movie ever! I am so excited to see this movie you have no idea! And it's featuring Dory as the lead! What could get better! To end the night, I hit 400 followers! Huge shout out to Dawn at Adventures in First with Mrs. Key! Go show her some bloggy love! She won the first copy of my new font pack from my FB giveaway! 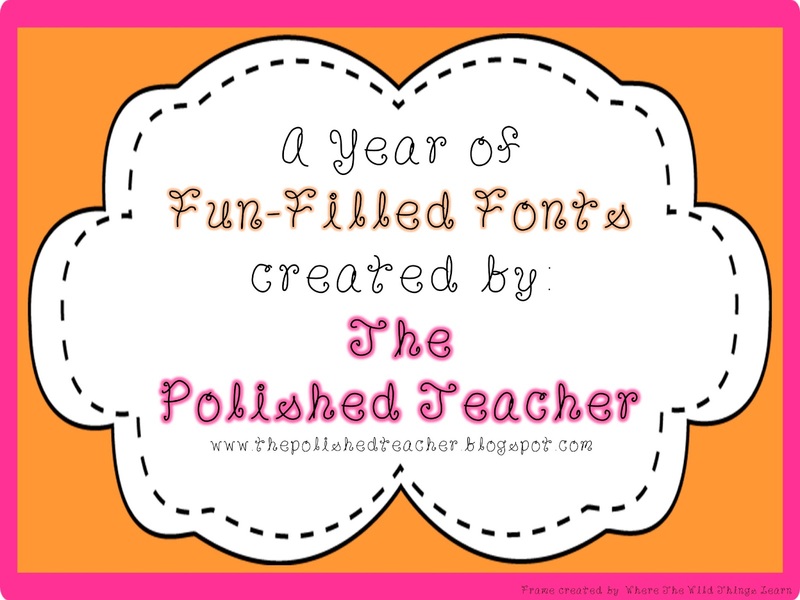 A Year of Fun Filled Fonts! It features a font for each month of the year! I am really excited about it! It will be exclusive to giveaway prizes because I don't have a TPT store to sell it in. There will be a select few who have these fonts! I will be giving away some copies for my giveaway so you won't want to miss out! I have some really amazing prizes lined up for my 400 follower giveaway! Trust me you are NOT going to want to miss this one! Be sure to follow my blog so you get the latest updates on the giveaway going live! Hahaha I had friends all over Facebook last night excited about Finding Dory! I've started following you too- new to the blogging world but your nail polish design caught my eye a few weeks ago! I'm looking forward go checking out more of your posts at lunchtime! Aww..this is great! Thank you! I love your new fonts, and I can't wait to use them each month. I wish you the best of luck on your student teaching! Having your own classroom is so different and fun! Five For (Couldn't Wait For Next) Friday! Super Shopping Sunday Shopping Spree!